The 19th annual Leaders of Tomorrow Awards Program for Wetaskiwin and area was held at the Reynolds-Alberta Museum the evening of April 7th. This is a program to recognize the good kids who are making a positive difference in their homes, communities and schools through sharing their talents and assisting in very wide variety of ways. The comments made about them include: does not judge, leads by example, helps set up and clean up, includes everyone in activities, assists staff whenever asked, initiated anti-bullying initiatives in his or her school, always cheery even when doing monotonous tasks, teaches skills in area of expertise, positive, gives 100%, listens to others' problems and ideas, insightful, motivates from behind the scenes, succeeds through cooperation, goes above and beyond to help, mentors younger players, an example of high moral standards, walks the talk, and enables and encourages others to do well. These are the young people who are a joy to be around, who are and will continue to be the kind of leaders we need. Each young person nominated receives a personal certificate of nomination, a copy of their biography as it was read at the Awards Program, a pin and a T-shirt. The four young people who are recognized as representatives for their respective age categories also receive a trophy and a cheque to present to the charity of their choice. The cheque for charity has been $100, but this year one of the sponsors, the Wetaskiwin Credit Union, is celebrating its 100th Anniversary and made matching that $100 dollar donation part of its celebration, so the charities each received $200. Katie Ballhorn was nominated by Sacred Heart School where she encourages good sportsmanship and good work ethics by example on her basketball, volleyball, and badminton teams. However, most of her volunteer work revolves around the Lakedell Agricultural Society, the Lakedell 4-H Club, and the Pigeon Lake Gymkhana Club. She will often get off her school bus at the Ag Centre and help with general office work, stocking vending machines, or help with preparations such as posters or decorations for upcoming events. She also bakes, sets up, sells tickets, works concessions, and cleans up for events. For a Youth Riding Camp she decided to device an effective system to let all riders anonymously commend good sportsmanship in others that converted into rewards for those commended. Katie also assisted the camp in many other ways, such as baking snacks, organizing crafts, and assisting younger riders. After helping create the video that was important to her 4-H Club winning a free Gord Bamford concert last fall, she also helped set up, work the gate, and sell tickets for it. She was MC for her 4-H Club's public speaking event and also does grooming and footfall demonstrations for the younger members. Katie believes much more can be accomplished by working together, and considers the things she does in the community as simply the right thing to do. Tabatha Wallace was nominated by Jeanette Simpson of Wetaskiwin Composite High School for the quality and effectiveness of her leadership. As co-president of the Student council, Tabitha is an approachable good listener who seeks awareness of all students' interests and desires so that she can help bring activities that will include everyone in school events and draw in the variety of groups active within the school. She leads by example, modeling a positive attitude and high expectations of herself. Active in the drama club, she has tried directing as well as acting on stage. She helps create awareness with the Gay-Straight Alliance Club and as panelist for Camp Fyrefly in Schools Program. 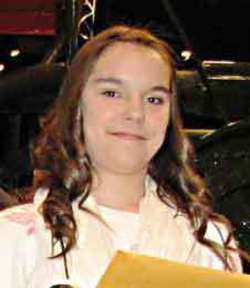 As a representative for the City of Wetaskiwin, Tabatha has travelled to Ottawa twice for Adventures in Citizenship and for Encounters with Canada: Political Week, and was one of the students visiting Ashoro, Japan last year. Tabatha believes that a leader needs the balance to know and understand others' opinions while having the ability and integrity to know when and how to make executive decisions. She loves doing what she is doing and hopes that the groups and clubs she is involved with will thrive and continue to help create a great environment for others. Emma Ripka was nominated by Wetaskiwin Composite High School for her enthusiasm and hard work in all areas of school leadership. As an active member of basketball, badminton, track, and the music groups Choir and Jazz Cats, Emma sets the example of leadership that stays positive and energetic, especially in times of struggle, and higlights others' strengths rather than their flaws. She is the elected operations manager on the School Council, so she helps develop the events the student body wants, helped initiate the merchandise sales which raise funds for different causes. The school community is very proud of raising thousands of dollars towards building a school in Ecuador. Emma's interest in politics has taken her to the Forum for Young Canadians, MLA for a Day, representing our constituency in PCC, and participating in a SUNIA international affairs camp. Loving children, Emma volunteers at Ecole' Parkdale School as anything from playmate to French tutor. Her daily goal is to make everyone she encounters feel better by being positive and always smiling. She finds positivity contagious, and enjoys making a difference in lives around her.